Welcome to the October 2018 issue of the TZelement MAG! We’re pleased you could join us for more POSITIVE vibes, valuable information and great conversation (and we appreciate you bringing a few friends along). To kick things off, we’ve decided to shift our POSITIVITY into a higher gear! 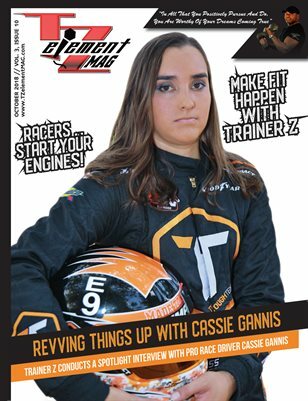 That’s right, we’re speeding up the pace to give you an inside look at life (on and off the track) with Professional Race Car Driver “Cassie Gannis” – a racer who gives the phrase girl-power new meaning! In our effort to compliment Cassie’s race-ready swag, we present the ‘Formula 1 Pirelli 2018 – United States Grand Prix’ with “Racers … Start Your Engines!” … an editorial that spotlights two of music’s biggest stars (who are accustomed to performing in the fast lane). And if that’s not enough, we’ve got you covered on the techno-tip as well. There’s a thrilling game featured in our “App Focus” – and with a name like ‘NASCAR RUSH’ you’re in for a virtual trip. In our “Product Focus”, we are featuring some fitness fun with the ‘Strength Stack 52” exercise cards. And to bring things full circle with tips to ‘Make FIT Happen’, we turn it over to ‘Trainer Z’ – for the professional 411 on ways you can make your workout work for you. Traditionally, October marks the start of cooler weather; but, instead of cooling down, our team will be busy turning up the heat with first-hand news, interviews, products, tips and helpful information (so, keep it locked for future issues). Our motto is what we present to the world: NO NEGATIVITY, STRICTLY POSITIVITY (a mantra that seeks to respect and inspire), and we appreciate you being part of that. Thank you for being a member of this incredible community where information is shared, entertainment is appreciated, and members are challenged to become stronger as they push harder. We’re a ‘Community of One’; we Think it Through, Talk it Over and Work it Out! Together our attitudes create great moments, which turn into great days, that become part of what’s great about life and those around us. So, let’s continue to be GREAT together! As we enjoy this issue, let’s bear in mind that we are in charge of what we feel and what we choose for ourselves. Thank you for feeling the POSITIVE movement we’ve created, and for making the informed choice to support it! Now, let’s Get Out There … Take Charge … and WIN!